Spring weather is just around the corner! With this, it is essential to maintain your wood fence so that it stays in great shape throughout the year. Spring weather is just around the corner! With this, it is essential to maintain your wood fence so that it stays in great shape throughout the year. The upcoming season can be an unpredictable one, especially in Maryland. Whether the weeks ahead bring rain, snow, or warm weather, make sure that your fence is well prepared for whatever the season brings! Consider how you can easily maintain your wood fence for spring weather this year. One of the first steps to take before staining or repairing your fence for spring is to check for any loose, broken, or rotted fence boards and posts. This simple step of inspecting your fence will allow you to identify any necessary repairs that must be made before staining your fence for the season. Additionally, it will help you to determine whether or not your wood fence should be replaced altogether, particularly if it contains a considerable amount of mold. Repairing or replacing loose fence posts and boards will help to restore the structural integrity of your fence. With new boards or new posts, your fence will be able to stand straighter and provide your yard with the privacy and sound barrier that you want for your outdoor space. Once these loose boards are removed and replaced, you are prepared to paint or stain your fence for the season. Because winter weather can be especially harsh on a wood fence, your fence may require a new stain or coat of paint this spring. 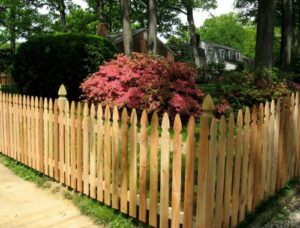 A stain will not only ensure that your wood fence is well-protected, but it will also give it a polished look that highlights the look of the wood-grain on your fence. A coat of paint, such as a classic white, will create a clean look for your landscape, adding curb appeal to your home as well. After your fence has been repaired and repainted, you can easily dress it up with beautiful flowers and plants for the year. Bring your outdoor space to life this spring with a freshly stained or painted fence that is lined with colorful flowers and plants in a variety of textures. With a revitalized outdoor space, you and your family will love spending time outside in your yard this year.